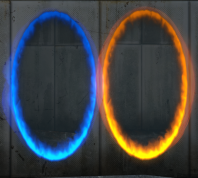 Portals are the primary gameplay mechanic of the Portal series. Portals can only be placed on white, flat surfaces by an Aperture Science Handheld Portal Device (simply referred to as a Portal Gun), and works in pairs thereby allowing two-way movement through each portal. Portals in a pair act as a direct link between one another. Anything that goes into one portal comes instantly out the other. Objects going at high speed into a portal (such as falling into one from great height) will maintain their speed when coming out of the other, giving the player the ability to launch themselves or other objects through the air. Portals are also capable of continuing any sort of beam, specifically the Excursion Funnels, Thermal Discouragement Beams, and Hard Light Bridges. If only one portal in a pair exists at the moment, the existing portal is an oval completely filled in with color. When attempting to enter an unpaired portal, it will act as a solid wall. When both portals in a pair exist, they will appear to be like windows. When looking through one portal, you can see directly out the other. When a portal is linked, you can identify which portal it is by looking at its colored border. 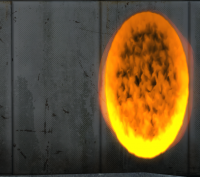 Once the player obtains the Portal Device, they can create a portal on a surface by aiming at the spot they want to put the portal and pressing the primary or secondary fire key. If the player has only acquired the Single Portal Device, both fire keys produce the primary portal color. If they have acquired the Dual Portal Device, the primary fire key produces the primary color and the secondary fire key produces the secondary color. Portals cannot be placed on surfaces that are not made of the appropriate material (white walls usually indicate this material), moving, not flat, or not large enough for a portal to fit onto it. Portals also cannot be placed while looking through currently existing portals. In Portal and the single-player campaign of Portal 2, protagonist and test subject Chell can create blue (primary) and orange (secondary) portals with her version of the Dual Portal Gun. 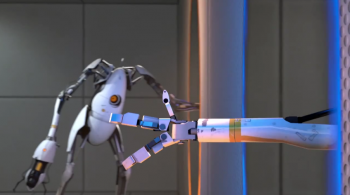 In Portal 2's co-op campaign, each robot test subject possesses individual portal colors in order to differentiate them; Atlas creates cyan (primary) and dark blue (secondary) portals, whereas P-body creates yellow (primary) and red (secondary) portals. The portals have had several changes in design before the final release of Portal in October 10, 2007, as evident in some trailers and screenshots. 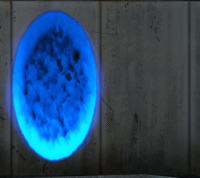 Even Earlier development screenshots from Portal revealed that the original colors for the portals were light blue (primary-fire) and dark blue (secondary-fire), with the portals more resembling like rifts ripped into a dimension than the simpler oval designs in the current series. Later, the purple color was replaced with red, akin to P-Body's secondary-fire in Portal 2. At some point, the developers decided to maintain the blue and orange color schemes previously used as portals in Narbacular Drop. Both portals from the early 2005 beta. Another view of the 2005-era portals. Primary-fire 'vine' portal rift as seen in the Orientation Video teaser trailer. Another view of the 'vine' portal rifts..
A dated screenshot from the Steam Store depicting early portals of the "swirl" portals, now bearing a proper oval shape. Another view of the 'swirl' portals. This page was last modified on 7 July 2018, at 22:54.